Are your children obsessed with the Pirates of the Caribbean franchise? Are you hooked on the NBC series Crossbones that stars John Malkovich as Blackbeard? Do you long to talk like a pirate more than one day out of the year? If so, then El Galeón Andalucía, docked in Ocean City. MD from August 1 – September 1, 2014, invites you to step back in time and imagine the Golden Age of Pirates. Best of all, El Galeón Andalucía was featured in Crossbones; now fans can walk her decks. 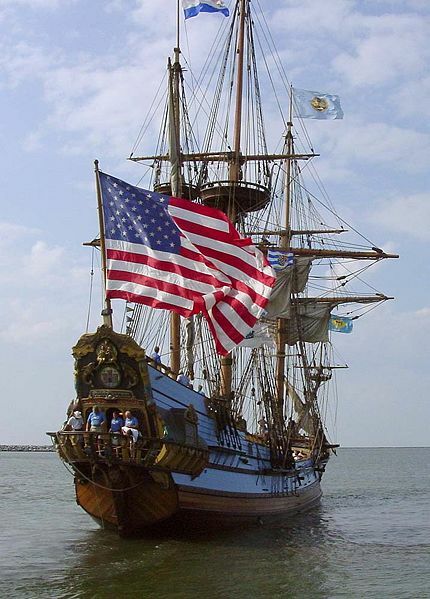 El Galeón will be docked bayside at 3rd street and Chicago Avenue in Ocean City, Maryland and will be open to visitors August 1 – September 1, 2014 from 10:00 am until 6:00pm each day. Travel back in time 500 years when you step onboard the magnificent El Galeón Andalucía, and experience first-hand what it was like explore the World in the 16th century. El Galeón Andalucía is a replica of the late 16th century fabled merchant vessels and war ships that made up the early navies of Europe. She is the only galeón class vessel sailing the open seas today. The galeón class vessel was an ocean going ship type that evolved from the carrack in the second half of 16th century. Galeóns were constructed from oak, pine and various hardwoods for hull and decking. Hundreds of expert tradesmen, including carpenters, blacksmiths, shipwrights and pitch-melters worked day and night for months to make a galeón seaworthy. Due to the long periods spent at sea and poor conditions on board, many of the crew perished during the voyage; therefore advanced rigging systems were developed so that the vessel could be sailed by a smaller crew. On one special night, you can “Party with the Pirates” aboard the El Galeón Andalucía during a VIP event. Appetizers, soft drinks, beer and wine will be served during this rare chance for the public to experience El Galeón in the evening and enjoy the sunset onboard. Meet the Captain and crew and hear in their own words what it is like to sail on El Galeón. Learn about the vessel and its history from the perspective of those who sail on it. $75.00 per person. Save 25% when you purchase your general admission tickets online in advance. Print-at-home or if you don’t have a printer, place your tickets in will-call and lock in the savings. Categories: Family Travel, Maryland | Tags: 16th Century Ship, Adventure Travel, Crossbones, Crossbones Ship, Family Travel, Galeón, Kids, Maryland, Mid Atlantic Region, Mid Atlantic States, Mid Atlantic Travel, Party with the Pirates, Pirate Party, Pirate Ship, Pirate Ship in Ocean City, Pirates, Tall Ship in Ocean City, Tall Ships, Tall Ships Maryland | Permalink. Image Courtesy of Pride of Baltimore, Inc. Pride of Baltimore II, a replica armed schooner from the War of 1812 will be docked at Fort McHenry during the July 4th weekend. Learn how Baltimore’s armed schooners wreaked havoc on British merchant ships during the War of 1812 resulting in the 1814 Battle of Baltimore. Free deck tours led by expert sailors from the crew will give insight into 19-Century maritime life and what it takes to sail Pride II today. 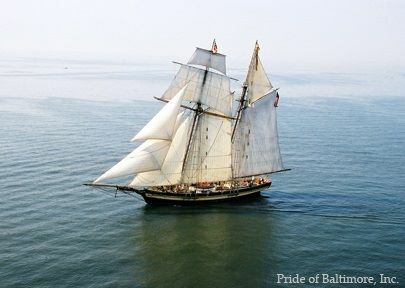 Pride II will be making various ports-of-call around the Chesapeake Bay this year – but this weekend you get a “Two for one” deal by seeing Pride II and Fort McHenry. July 4 9:00 a.m. – 4:00 p.m.
July 5 9:00 a.m. – 1:00 p.m. and 4:30 -5:30 p.m.
On July 5th arrive at 4:30 and tour Pride II and then walk up to the fort for the military tattoo ceremony starting at 6:00 p.m. This Free ceremony will feature the U.S. Army Fife and Drum Corps, Continental Color Guard and U.S. Army Drill Team. Categories: Maryland, War of 1812 | Tags: Fort McHenry National Park, Pride of Baltimore II, Reduced Admission, Tall Ships, Tall Ships Maryland, Two-For-One | Permalink. Popular movies, like those in the Pirates of the Caribbean franchise, give viewers the impression that seafarers during the Golden Age of Pirates traveled the oceans in massive ships with ample cabins. Nearly 200 years earlier, in 1492, the reality was much different. When I first saw replicas of the Niña and Pinta, I was alternately appalled and amazed that discoverers set off in uncharted waters in such small crafts. Now you can view the Niña, the most historically accurate Columbus replica ship ever built, at the Chesapeake Bay Maritime Museum (CBMM). Replicas of two of Christopher Columbus’ ships, the Niña and Pinta, are set to dock at CBMM in St. Michaels this May 10 – 18, with boarding opportunities available daily between 9 a.m. and 6 p.m. daily for unscheduled, self-guided tours. Tickets include tours of both ships and will be available upon boarding at $8 for adults, $7 for seniors, and $6 for students 5-16, with children 4 and under free. Museum admission is an additional cost for non-CBMM members. The Niña is a replica of the ship on which Columbus sailed across the Atlantic on his three voyages of discovery to the new world beginning in 1492. Columbus sailed the tiny ship over 25,000 miles. It is an exact replica and was built completely by hand and without the use of power tools before her 1991 launch. The Pinta, an authentic reproduction of Christopher Columbus’ ship, was launched in 2005 in Valenca, Brazil. Both ships tour together as a sailing museum dedicated to educating the public and school children. On board exhibits highlight the history of the Age of Discovery, navigation of the era, how the ships were built, and a taste of what life was like more than 500 years ago. Categories: Maryland | Tags: Chesapeake Bay Maritime Museum, Columbus Ships, Maryland, Mid Atlantic Travel, Niña, Pinta, Tall Ships | Permalink. The schooner will be docked harbor side at CBMM and sailing on the Chesapeake with students throughout the week. It serves as an on-the-water classroom for learning about the history and environment of the Chesapeake Bay. Sultana provides day-long programs as well as live-aboard programs for participants. The Sultana will be open for boarding to all museum visitors from 2:30 p.m. to 4:30 p.m. on Tuesday, May 6. The tour is free for museum members or with general admission. During Sultana’s visit, the Chesapeake Bay Maritime Museum’s waterfront campus and 12 exhibit buildings are open 9 a.m. to 5 p.m. For more information, visit http://www.cbmm.org or call 410-745-2916. Categories: Maryland | Tags: Chesapeake Bay Maritime Museum, Maryland, Mid Atlantic Region, St. Michaels, Tall Ships | Permalink.